For those that know me, it is absolutely no secret that I love organization. A neat, clean, tidy and orderly house is what I prefer. Now that we have moved into our own place, I'm slowly starting to get things put away and organized and I'm loving every second of it! 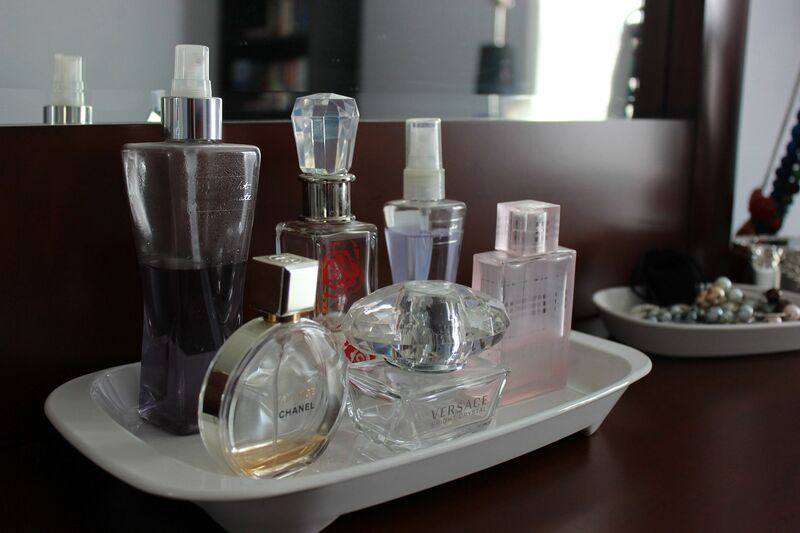 One thing I have started to do is to organize my things using unconventional items. Like in the kitchen, for example, I like to use decorative bowls around my sink to hold sponges and brushes. It just makes the kitchen look prettier and therefore orderly. 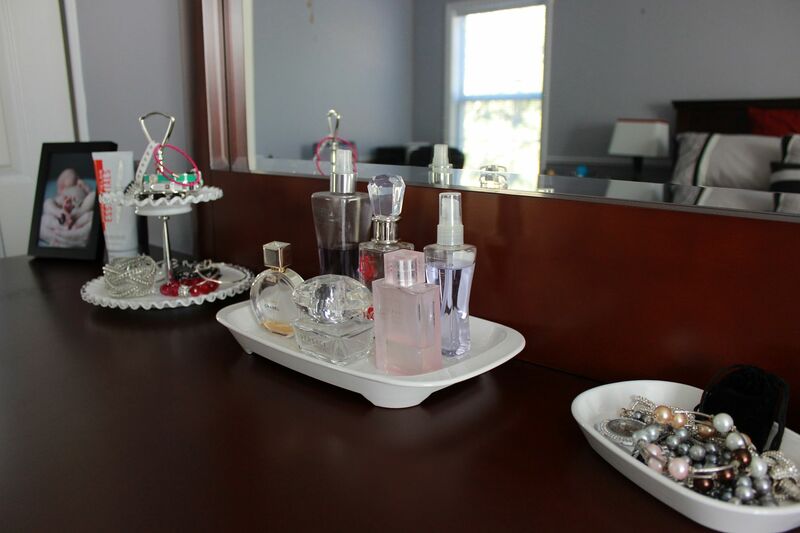 So when it came time to get my bedroom in order, particularly my dresser, I was on the hunt for some items to help organize my jewelry in a beautiful way. I love to have everything out where I can see it, that way I make sure I am using what I have instead of wearing the same pieces of jewelry over and over again. For awhile I have had a few pieces of corning ware from my Grandma and a gorgeous dessert tower from my Mimi, but had no clue what I was going to do with them. I knew I wanted to keep them, but wasn't sure if I would ever find a use for them. Enter my want to make things pretty and organized. 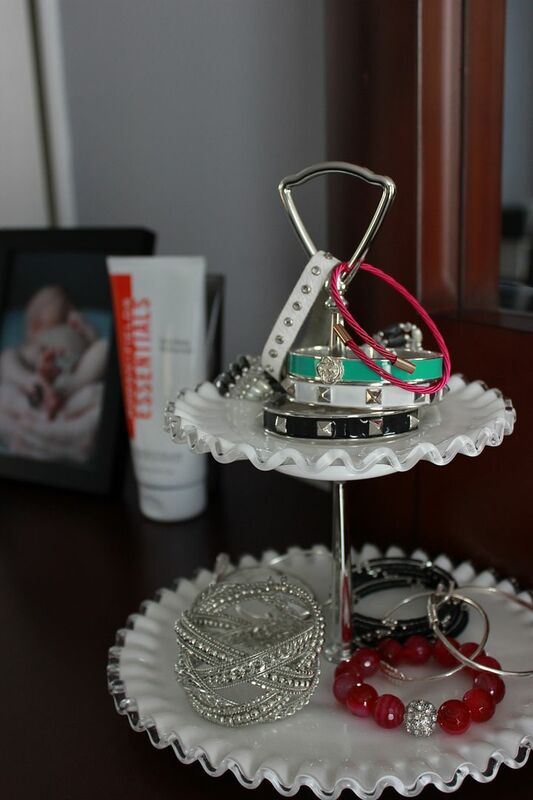 Now, I use the dessert tower and a small piece of corning ware to hold my bracelets and I use a large piece of corning ware to hold all of my fragrances and perfumes. Everything is displayed for me to see, but it still looks pretty and pleasing to the eye at the same time. 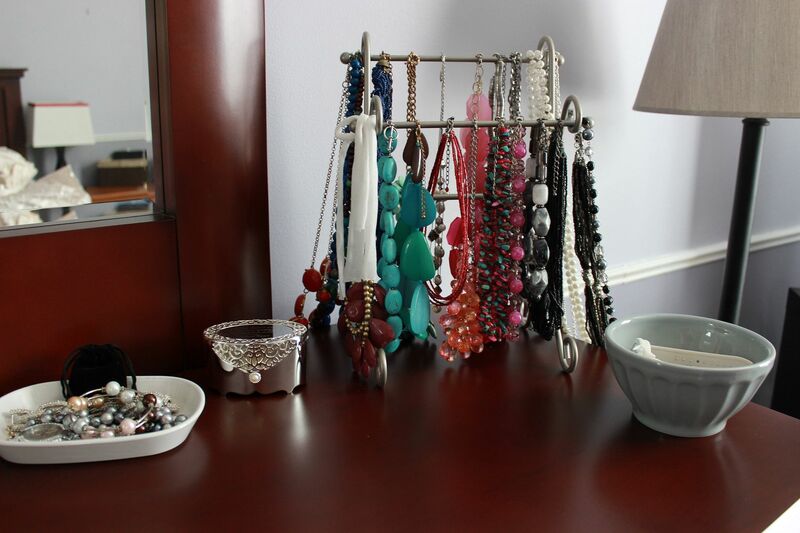 To organize my necklaces and keep them from getting tangled, I display everything on a fingertip towel holder. I mean seriously, who even uses a fingertip towel (what is a fingertip towel?)? The towel holder serves a much better purposes holding all of my necklaces. I also use a little bowl I picked up from Anthropologie to hold my pins and brooches. And my rings are kept in a beautiful silver jewelry box that Tolar gave me when I had Baby K.
I love how nice everything looks and that I can also see what I have when I'm selecting my accessories each morning. 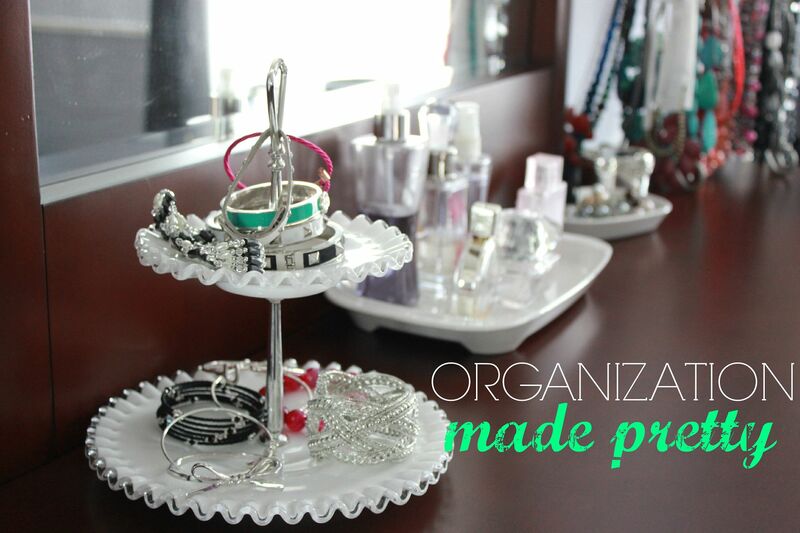 And the greatest thing about this little project, I didn't have to purchase a single thing to organize my jewelry. I had everything already - I just used a little imagination to use what I already had in a different way. Very cute! A great way to showcase your stuff, but also make it look neat and tidy! jewelry organization is hard!! i need a way to organize my bracelts and earrings! love these! I love your use what you've got mentality! Your organizational systems turned out awesome!